The equipment shown here is my personal equipment. Some of the equipment is new, some has been with me for many years. The important thing is not that you use what I do, but what works for you in each of the categories. Buy the best you can and the equipment will last a lifetime, as you will see in some of these pictures. I am not a believer in buying equipment for the sake of it. Especially when it comes to small wares. When I remodeled my kitchen, I put all of my small utensils in a box and whatever I didn’t use in six months, I donated to a resale shop. I used exactly one item and I don’t even remember what that was..
Baking sheets – Heavy sheets are important for even browning and to keep items from browning or burning before baking is completed. 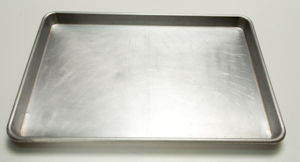 Professionally we used rimmed sheet and half sheet pans which have a 1/2 to 3/4 inch rim all the way around the pan for everything including cookies and I still use half sheets in my personal kitchen to help keep the amount of equipment to a minimum. Cookie sheets have upturned ends but open sides. Bowls – Several of each size of assorted bowls. 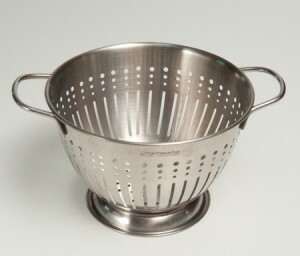 Colander – This utensil comes in plastic as well as aluminum and stainless steel with feet to hold it above a surface. It is used primarily to let water drain from a product. It is particularly useful to wash fruit and vegetables and drain pasta. 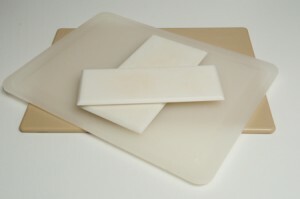 Cutting Boards – come in a variety of sizes and weights. Heavier ones will last longer and provide more stability. Placing a wet towel under the board will prevent it from moving while it is being used. 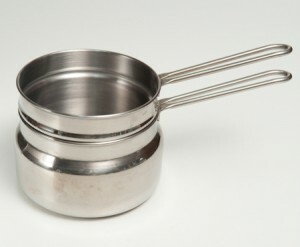 Double Boiler – This specialized piece of equipment consists of one pan seated inside of a second pan with room for water. 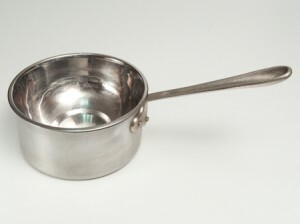 Water is added to the bottom pan so the contents of the upper pan can be warmed or cooked gently without direct heat to keep it from breaking or burning. Placing a bowl over a pan of simmering water is an alternative. 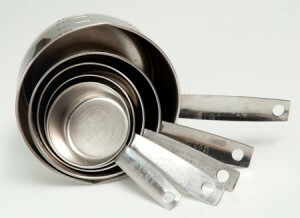 Dishers/scoopers – These are used for portion control and ease of shaping or dropping bakery items. They come in a variety of sizes with the highest number being the smallest size. 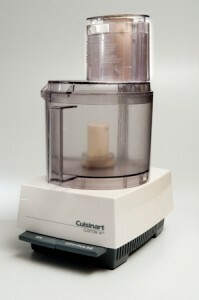 Food Processor –A food processor is an indispensible piece of equipment that changed how we cooked and baked when it was introduced in 1970. While it will not do everything, it minces, chops, mixes, purees, kneads bread dough, dices, slices, shreds and grinds a variety of foods. It is efficient and very fast, taking much of the time consuming aspects out of cooking and baking. There are various sizes of machines and motors and most of them come with several different blades, grating and slicing attachments. Because the blade turns about 30 miles an hour, it often requires recipes to put together differently than when using a mixer. The tasks this machine can perform are amazing. But there are some caveats. It doesn’t puree as good as a blender and nuts can be turned into butters or cut too finely in seconds. The pulse button can save you from disaster. The size of the motors vary as well as the capacity of the bowls. Processors usually come with several blades including an S shaped blade that chops and purees and several discs for slicing and shredding. The more powerful machines can make bread dough. 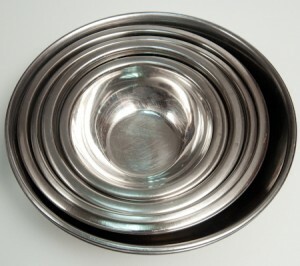 A feedtube on the lid of the plastic bowl allows food to be added while the machine is running. This is a real workhorse and a great piece of equipment for the sweet kitchen. 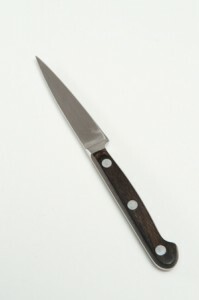 Knives – Good knives will last a lifetime. 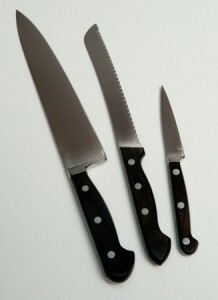 They don’t have to be the most expensive knives on the market but they should be balanced and hold a sharp edge. 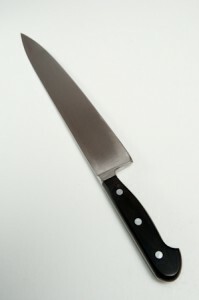 Essential knives include a paring knife, chef’s knife in a length that is comforttable and a good bread knife with which to cut desserts. 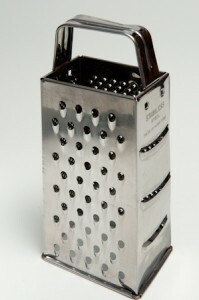 Grater – A box grater has many uses in the kitchen but I favor a microplaner for the baking/pastry kitchen. 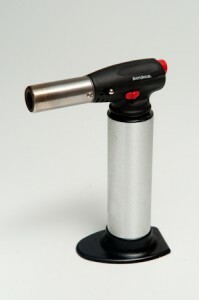 Heat Gun or Blow Torch – Used to heat the sides of pans to aid in the releasing of an item from its pan. This piece of equipment is particularly useful when removable rims are used. They are heated, the product is put on a can and slid down. Juicer – This is probably the oldest, ugliest juicer ever, but I love it. The looks of this is a testament to never putting aluminum items in a dishwasher. There are many versions of juicers including electric ones. This is a simple version were the cut citrus fruit is put on top of the juicer and twisted and pressed down to extract the juice while leaving the seeds behind. 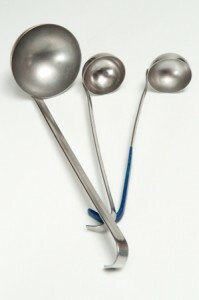 Ladles of different sizes are useful for portion control or to move liquids. 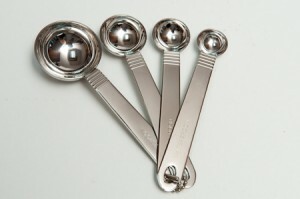 They come in different sizes and professional ladles are marked in ounces. 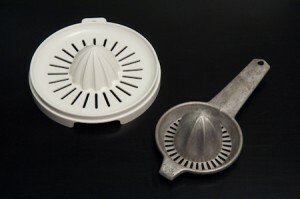 Measuring cups – come in wet and dry measures. 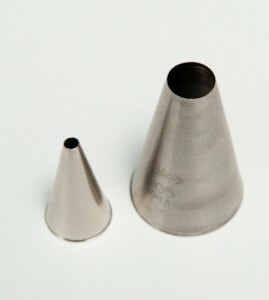 The wet measures have graduated sizes on them and are used for liquids which is why there is usually a lip on the top. They come in sizes from 1 cup up to 1 gallon. I have seen them in metal, ceramic, glass and plastic. Dry measures are used for any dry ingredient. The important thing here is to overfill the cup and sweep the excess off with the back of a knife or any flat utensils. While cups are fine for some items, weighing dry ingredients is used by professionals and is encouraged for pastry/baking success. 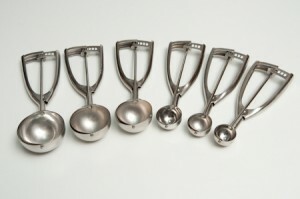 Measuring spoons – used to measure small amounts of ingredients. They come in a variety of sizes held together on a ring. Microplaner – This is one of the most wonderful tools in a kitchen. 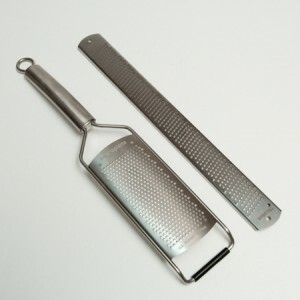 Microplaners can be used to grate citrus rinds, chocolate, nutmeg, etc. They are particularly good as they remove the zest from citrus fruits without taking the bitter white pith underneath. They also keep the zest dry. Mixer – this is a necessary piece of equipment for pastry making. They are used to combine, beat or whip ingredients. There are hand mixers and stand mixers that go from 4 1/2 quarts to huge 140 quart commercial mixers. Generally speaking, hand mixers do not have enough power for many baking and pastry applications. Stand mixers have more power and in addition to performing baking and pastry tasks, many come with attachments that enable them to perform even more tasks such as grinding meat, stuffing sausage, juicing citrus, crushing ice and making pasta. 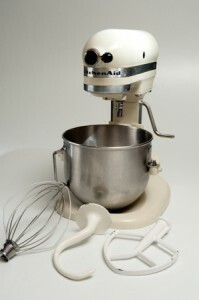 Most of the stand mixers come with a paddle, whisk and dough hook for making bread. I use a 5 quart KitchenAid mixer but have also used Cuisinart and Kenmore mixers. Every company makes more than one size. All of my recipes are figured for a 5 quart mixer. 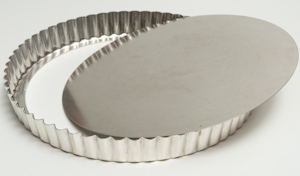 Pancake Turners – are used to move tarts to their boards or platters. Two sturdy turners are placed, one on each side, to lift the tart and move it into place. At the shop we referred to these as “lifter uppers”. Literal, but everyone knew what they were for. 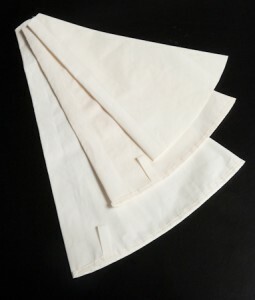 Pastry Bags – are used in conjunction with pastry tips to finish pastries. They can be plastic, cloth or disposable plastic and come in various sizes. 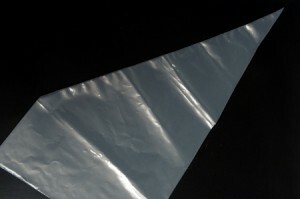 Disposable plastic bags are used professionally to avoid cleanliness issues. If large, they can be cut down. Non disposable bags should be turned inside out and washed in warm soapy water. The bags can be filled with buttercream, chocolate ganache, whipped cream, pastry cream or other sweet items to fill or finish pastry. 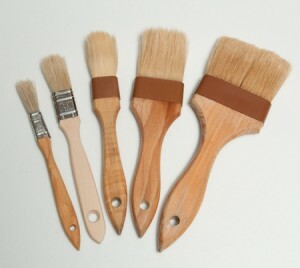 Pastry Brushes – come in a variety of widths and sizes. They are useful for washing down the sides of pans, brushing flour away, applying glazes and more. While expensive, it is best to use natural bristles. The plastic bristle brushes can melt on a hot pan. Pastry Tips – are used with pastry bags. The tips used in this book include #5 and #8 open star, #48 basketweave and #5 plain tip. 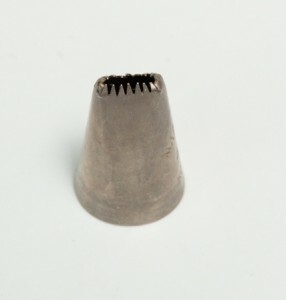 A well used Basketweave Tip. 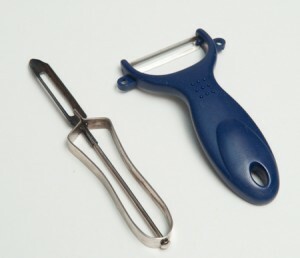 Peeler, Vegetable – There are many styles of peelers available including ergonomic ones. 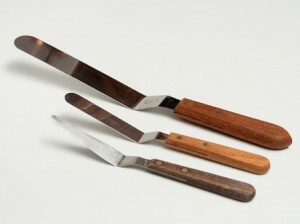 I like the old fashioned version that has a rounded end for digging out the eyes of potatoes or other produce. The important thing here is to find one that is comfortable in your hand. 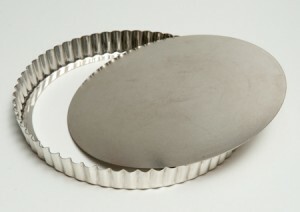 Quiche pans– See tart pans with removable bottoms. 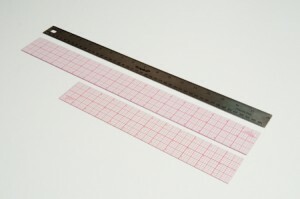 Ruler – Any ruler, plastic or metal can be used. 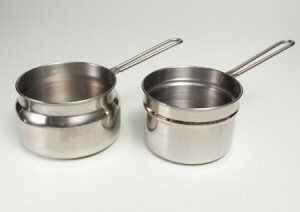 Saucepans – Several sizes of pans including small to medium are used. 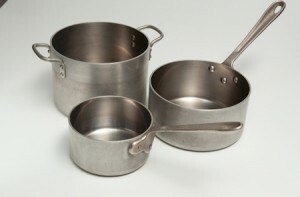 Heavy pans will not only last a lifetime but prevent items from burning and allow more even heat disbursement. Scales– My mantra is scales, scales, scales. Not only for accuracy but for speed. 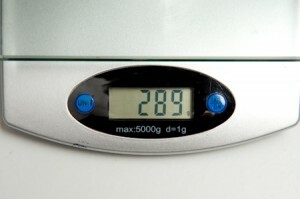 It is so much faster to weigh ingredients than to measure with spoons and cups. 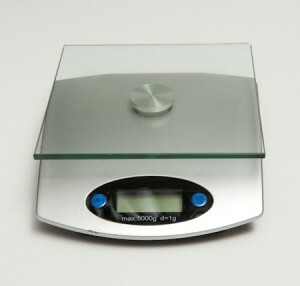 Since successful baking and pastry depend upon the accuracy of measurements, scales provide a foolproof way of measuring. No professional should ever measure with anything but a scale. Most scales weight in both grams and ounces. However, in the spirit of compromise, if you don’t use a scale, stir the flour briefly in the bag or canister as it settles. Dip a dry measure into the flour and fill to overflowing; sweep off the excess. 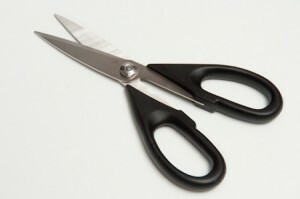 Scissors – A sturdy pair will last longer and complete more tasks easily. 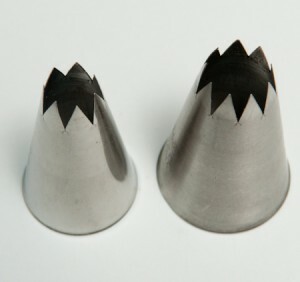 Scrapers – Scrapers are indispensible tools for baking and pastry. 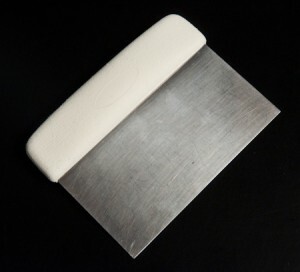 The bench scraper was originally used to scrape flour off of the area used to make bread which is referred to as a bench – hence bench scraper. 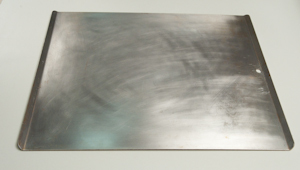 In addition to scraping clean a work area, this scraper can be used to cut dough into pieces. The second scraper is a bowl scraper used to get everything out of a mixing bowl. 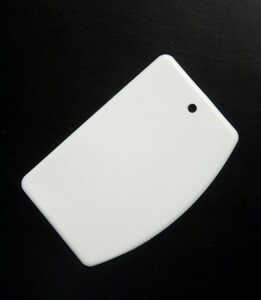 It is plastic and has a curved side and a flat side. The curved side is used to scrape out the sides and bottom of a bowl. 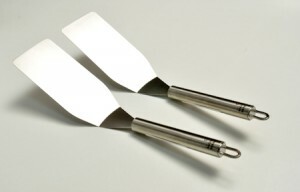 Spatulas, Metal – Large and small metal spatulas are important for frosting canes and releasing items from pans. 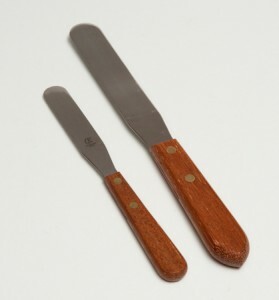 Spatulas, Metal, Offset – Off set spatulas in both large, small and pointed are important for frosting cakes, particularly finishing the top, spreading any number of items out and releasing items from pans. The pointy one is useful for scalloped edge pans such as the pans used in this book. 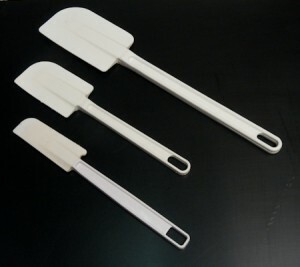 Spatulas, Rubber – Various sizes are available. From narrow to wide from about 13 inches to 20 inches, they serve a variety of duties in the baking/pastry kitchen. Do not use regular rubber spatulas in hot items. There are specially made high heat spatulas for use in hot pots. 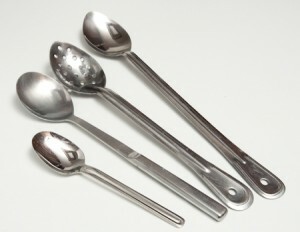 Spoons of various sizes are useful from small tasting spoons to larger ones used to stir ingredients together. 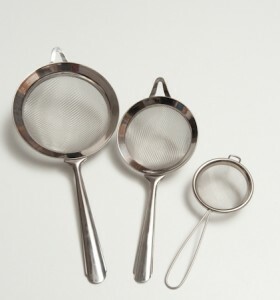 Strainer – A variety of strainers in different mesh sizes are useful for straining, washing fresh fruit an sprinkling powdered sugar among other things. They often come in sets of varying sizes. 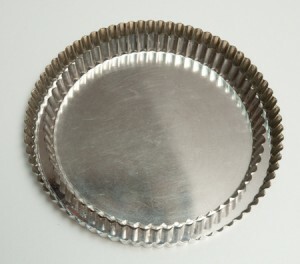 Tart pans with removable bottoms – Also referred to as quiche pans, these short tart pans with fluted rims, usually have sides that are 3/4 to 1 inch tall. The bottoms come out which makes anything in them very easy to release without turning the pan upside down. These come in various sizes from 3 1/2 inches, which is the smallest pan I have used to 12” round. I have also seen them in square and rectangular pans. 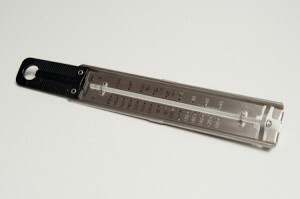 Thermometers – There are a variety of thermometers for different uses. 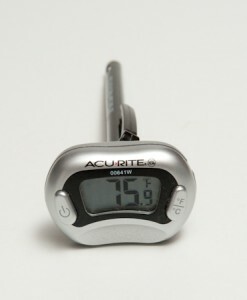 Freezer and refrigerator thermometers are important to keep track of the temperatures for safety. Freezers should be kept at 0 degrees or below. Refrigerators should be kept at 40 degrees. 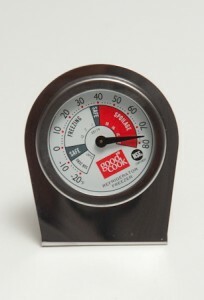 A candy thermometer registers high temperatures used in candy and sugar work. 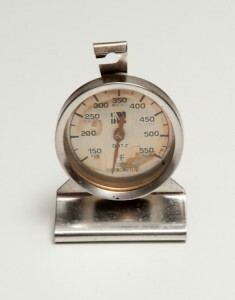 An instant read thermometer records temperatures very quickly. The temperature ranges can vary. Equally important is the oven thermometer to make sure it is heating correctly. If not, the oven can be adjusted up or down. 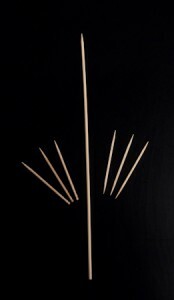 Toothpicks and Skewers – These are used to finish desserts. 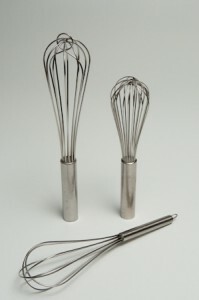 Whisks – can be used for various tasks in the kitchen, including mixing and whipping ingredients. They come in very fine wire to heavy wire depending upon the use. They also come in various heights to accommodate different size containers. This entry was posted in Front Page and tagged baking, baking equipment, equipment on August 5, 2012 by hfletcher.